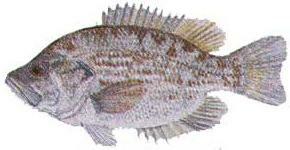 The Sacramento Perch, Archoplites interruptus, is the only sunfish native to the western United States, where it was historically found in northern and central California. Only one native population of the species, located in Clear Lake, California, currently exists, however. The species is not native to Utah, but it has been introduced to several reservoirs in the northern and western parts of the state, including Pruess Lake. The Sacramento perch eats primarily benthic (bottom-dwelling) prey, such at insect larvae, snails, and fishes. The species spawns throughout the spring and summer, and eggs hatch in about four days. The Sacramento Perch is not very aggressive, which often makes it difficult to catch.